So, my son (22 months, though I need to get over myself and just start saying almost two) usually sleeps in a Zippadee Zip. He loves it, always has. In the summer, he wears a onesie or short-sleeve/shorts romper type thing under the Zippy. In the winter, he wears long-sleeve, footed jammies under it. We live in Texas, so very hot summers and mild winters. We keep the house at 70 overnight during the summer and 66 during winter (though we used to keep it much colder pre-child and I’m looking forward to the day when we can again). All of this background to say that a few nights ago, my son flat-out refused to wear his Zippy. He wanted to go down with a blanket, like he does for naps at daycare. He refused to wear socks as well (he spent forever trying to get them off). To say the night went poorly is an understatement. He woke up (I’m assuming because he was cold, though he’s not old enough to actually articulate what’s going on) and tossed and turned, wide awake, for literally hours. I’m thanking my lucky stars that he changed his mind the next night and happily accepted his Zippy. Do they wear footed jammies year-round? Should I keep the house warmer? Is there anything I should do to encourage sleeping under the blanket or do they really just sort of figure it out for themselves? Thank you! It seems like such a basic transition, but I’m stumped. It really depends on the toddler! Let us never forget about the twin toddlers who would remove pajamas and diapers every night in order to fling poo at each other. That a toddler you don’t dress for the climate; you dress them for WARFARE. Your son will probably get it eventually and enjoy the feeling of being under the covers — though it might not fully “click” until he’s transitioned to an actual bed. And that’s fine! There’s absolutely no medal or milestone for reaching the “Does Not Kick Blanket Off Then Sob About Loss Of Said Blanket” stage of childhood. My three kids worked out the blanket thing in their own time and it was easier once they transitioned to a bed. We always used the light cotton footed pajamas for our hot summer sleepers (upstate NY). Children’s Place was my favorite place to get them because they were stretchy!! Both of my kids eventually figured out how to sleep under blankets, but it took a surprisingly long time. Rather than heating the whole house we just got a space heater for her room. We went with a model that is safe to run overnight and had a built in timer with it. It was an oil-filled radiant space heater so it didn’t get super hot to the touch ever. My son is a bit over 1 (upstate NY) and we do fleece footie PJs in the winter and just a onesie in the summer. He’s only very recently started getting put down with a blanket, but never keeps in on and often ends up op top of it. He doesn’t seem to mind. To agree with someone else – at some point it won’t matter because they’ll have stubborn opinions. My 4.5 yr old wears PJs some nights, and some nights nothing but underwear, blanket on/blanket off… Its not worth the argument since she sleeps through the night either way. 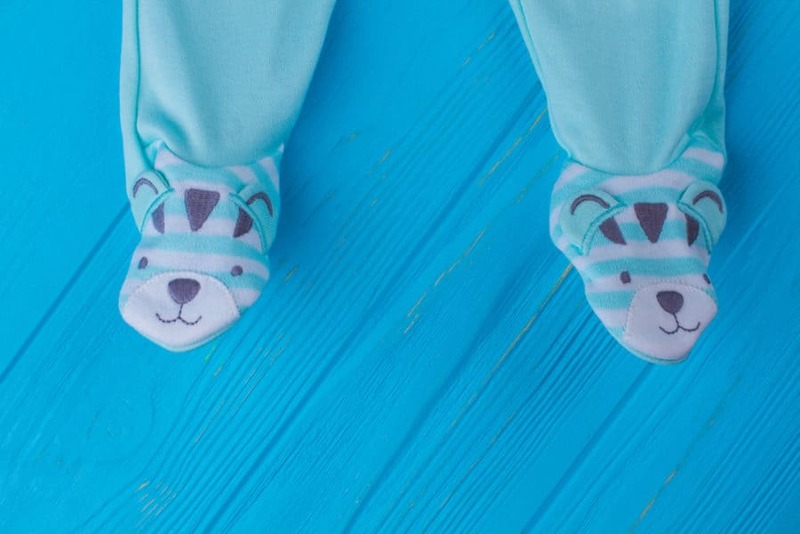 We use footed sleep sacks for toddlers – They are a wearable, zip up fleece blankets with cuffs for their feet to come through. They provide a second layer for whatever they are wearing underneath that can’t be shrugged off like a blanket.